The Miniature Schnauzer is alert and spirited, yet obedient to command. They do well with owners who like to teach “tricks” and play games. They are often accused of understanding every word you say and enjoy it when you talk to them. They are friendly, intelligent and willing to please which make them very easy to train and wonderful with children and other animals. The Mini Schnauzer makes an excellent watchdog. They are suspicious of strangers until the owner of the home welcomes the guest, upon which they are typically very friendly to them. Miniature Schnauzers are not aggressive by nature and tend to love everyone they meet. They are relatively fearless, and once mature, the Miniature Schnauzer has a strongly developed territorial instinct. He is an ideal guard dog, defending by barking and raising a fuss rather than physically. A good Mini Schnauzer will bark at anyone who may appear a threat to his home, but is not an incessant barker. They are discriminating and intelligent guard dogs that assume this duty naturally. Miniature Schnauzers are highly intelligent and generally easy to train. They are playful dogs, but if you ignore them, they may become bored and mischievous. My Schnauzers have been known to hide my husband’s work boots because they don’t want him to leave. Mini Schnauzers are highly prey driven and may attack other small animals such as birds, gophers, squirrels, and rodents. Schnauzers get along with the family cat but will occasionally chase the cat but only for fun. As soon as the cat hisses, they go find someone else to play with them. Schnauzers do not shed and are recommended for people with allergies because they do not generally have pet dander. Schnauzers are a ‘wash and wear’ type dog. They need a bath once or twice a month (unless they get really dirty). You can have them groomed professionally every other month or you can easily learn to do it yourself. Brush them out after their bath, clip their toenails once a month, clean their ears when they are groomed and that’s about it. They are pretty easy. See the Grooming page for detailed instructions here. According to AKC standards for show dogs, miniature schnauzers are 12 inches to 14 inches at the shoulder. There is no weight range for this breed in the AKC standards. Size-What about “Toy and Teacup” Schnauzers? Ahhh---this is where it is important to understand the difference between the “Breed” of the dog and the “Size” of a dog. 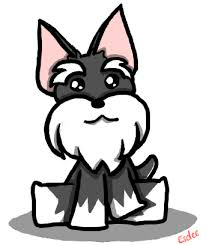 Miniature Schnauzer is the breed and, while the breed name does include the word “miniature” it does not mean that any dog who isn’t exactly 12 to 14 inches tall and doesn’t weigh between 12 and 20 pounds isn’t a Miniature Schnauzer. Put in human terms, “Miniature Schnauzer” would refer to your heritage or your lineage but it has nothing to do with how tall you are or how much you weigh. My husband is Native American (his heritage) but he is also tall, and slightly pudgy (don’t tell him I said that). Just because he is taller than average, or heavier than what the doctor says he should be, that doesn’t mean he isn’t Native American. Miniature Schnauzers are exactly the same. The terms “toy and teacup” refer more to their size and weight and not to their heritage (breed.) So all Miniature Schnauzers are registered as Miniature Schnauzers no matter what color they are, how tall, short, skinny, or fat they are. What makes them Miniature Schnauzers is their bloodlines….their heritage. It is that simple. Miniature Schnauzer: 12 to 14 inches tall and typically between 12 and 20 pound at one year of age. Toy Size: 9 to 11 inches tall and typically between 8 and 12 pounds at one year of age. Teacup Size: under 9 inches tall and under 8 pounds at one year of age. Micro Teacup size-under 5 inches tall and under 4 pounds at one year of age. I do NOT breed for this size and will not intentionally breed a puppy this size. Any puppy under this size is most likely sickly and/or has a liver shunt problem. Ears, Tails, Dew Claws, etc. The Miniature Schnauzer is typically seen with its tail docked, dew claws removed and the ears may or may not be cropped. All of my puppies are sold with natural ears so you may have them docked when your puppy is 10-12 weeks old if you want. Because schnauzers are prey driven and may dig to catch their prey, all puppies should have their dew claws removed before they are week old or they run the risk of ripping off their dew claws while in pursuit of their prey, while digging, or reaching through a chain link fence. The Miniature Schnauzer originated in Germany in the late 1800s. They were originally bred for guarding herds and farms, and for keeping rats and vermin out of the barns. In the Mini Schnauzer's earliest stages, several small breeds were crossed to bring down the size of the well-established Standard Schnauzer. The goal was to create a duplicate but in a much smaller size. Crossing with breeds such as the Affenpinscher, Poodle and Miniature Pinscher, had the side effect of introducing colors that were not considered acceptable to the ultimate goal. As breeders worked towards the stabilization of the gene pool, they stopped breeding mismarked parti-colors, liver, and white puppies (the colors that were introduced by the Affenpinsher, poodle and Miniature Pinscher). Although the Miniature Schnauzer also comes in liver (chocolate), wheaton (blonde), liver & tan, and solid white, the AKC only recognizes solid black, Salt & Pepper, and Black & Silver for conformation show events. The AKC will register the other ‘rare’ colors but they are not allowed to be shown. Merle Schnauzers are NOT a purebred schnauzer for two reasons 1) there is nothing in the history of the breed’s genetics (dating back to the 1500’s) that would allow the “merle” coloring (spots with blue eyes) and 2) the “merle” schnauzer has only recently been “discovered” which is impossible because of reason #1. The best Miniature Schnauzers are very smart and capable of learning a great deal, but they must be taught at an early age that they are not the rulers of the world. The persistence that makes them suited to killing vermin can be annoying when you try to teach them anything. Some, but not all, Miniature Schnauzers want to be the boss and will make you prove that you are in charge. You must show them that you mean what you say by being consistent. You cannot give into them even one time….they will never forget it if you do. So if you don’t want your puppy to sleep in your bed, don’t let them on your bed—ever! Everyone in the house must know the rules and stick to them or a schnauzer will quickly learn who is “easy” and who isn’t. They are that smart! See more information about training your Miniature Schnauzer on our Training Page here. Miniature Schnauzers are a fairly healthy breed living an average of 14 years. Most act like puppies and are happy, loving companions their entire life. The miniature schnauzer as a breed is not plagued with many prevalent health issues. However there are a handful of rare diseases to look out for. Not all Miniature Schnauzers will get any or all of these diseases, but it's important to be aware of them if you're considering this breed. •	Cataracts: Cataracts cause opacity on the lens of the eye, resulting in poor vision. The dog's eye(s) will have a cloudy appearance. Cataracts usually occur in old age and sometimes can be surgically removed to improve vision. •	Entropion: Entropion, which is usually obvious by six months of age, causes the eyelid to roll inward, irritating or injuring the eyeball. One or both eyes can be affected. If your Schnauzer has entropion, you may notice him rubbing at his eyes. The condition can be corrected surgically. •	Progressive Retinal Atrophy (PRA): This is a family of eye diseases that involves the gradual deterioration of the retina. Early in the disease, affected dogs become night-blind; they lose sight during the day as the disease progresses. Many affected dogs adapt well to their limited or lost vision, as long as their surroundings remain the same. •	Urinary Stones: These can cause your Miniature Schnauzer to start straining to urinate, pass blood in the urine, need to urinate more often than normal, and have cloudy or foul-smelling urine. While small bladder stones may pass on their own, your vet should be consulted. Dietary changes can't get rid of existing stones, but they can prevent more stones from forming. •	Myotonia Congenita: Only recently discovered in Miniature Schnauzers, this is a hereditary skeletomuscular disorder similar to muscular dystrophy. Symptoms begin when puppies are a few weeks old. Their muscles contract easily and they have prominent muscles in the shoulders and thighs. They have difficulty getting up, their coats are stiff, and they bunny-hop when running. Their tongues are enlarged and stiffen when touched, their lower jaws are peak-shaped, and they have difficulty swallowing. All breeding stock should be DNA-tested for the gene that causes it. •	Von Willebrand's Disease: Found in both dogs and humans, this is a blood disorder that affects the clotting process. An affected dog will have symptoms such as nosebleeds, bleeding gums, prolonged bleeding from surgery, prolonged bleeding during heat cycles or after whelping, and occasionally blood in the stool. This disorder is usually diagnosed between three and five years of age, and it can't be cured. However, it can be managed with treatments that include cauterizing or suturing injuries, transfusions before surgery, and avoidance of specific medications. •	Congenital Megaesophagus: This is a condition in which food and liquid are retained in the dog's esophagus, causing him to regurgitate his food. As a result, dogs can get aspiration pneumonia or their esophagus can become obstructed. Diet can be adjusted to provide for the least regurgitation. The disease itself can't be treated, only resulting conditions such as pneumonia; and the prognosis tends to be poor. Schnauzers come in all sorts of colors including the “standard three” of Black, Black & Silver, and Salt & Pepper. Less common colors (‘rare colors’) include solid White, Wheaton (blonde, champagne), Liver (chocolate), Liver Pepper, and Liver & Tan. All of those same colors are available in solid colors and Parti colors. Parti refers to the dog being partially (parti) white with another color, usually in large patches. So a dog may be a Black and White Parti, Salt & Pepper Parti, Liver Parti, Wheaton Parti or Liver & Pepper Parti. Important note for AKC registration of rare colors! When registering your puppy with AKC it is necessary to include two photos along with your puppy’s AKC registration paperwork. The photos must be a full front view as well as a side view of the puppy. All variations of the Liver color (Liver, Liver Tan, Liver Pepper), all Parti colors as well as White and Wheaton must include photos with the AKC paperwork. Address envelope to AKC and mark it with: “ATTN: KARLA DEITHORN-SPECIAL SERVICES” in order for your paperwork to be processed quickly. What’s up with the “Mega Coat,” “Standard Schnauzer Coat,” “Super Mega Coat,” and “Wire Coat”? What is the difference? First, let me say it is nearly impossible to tell with any certainty the final coat type (the thickness, texture, wiry, soft etc.) of a puppy before he or she is 6 months old. An educated guess based on the genetics of the puppy is the best anyone can do. The “Mega Coat,” “SuperMega Coat,” and “Glamor Coat” are soft, silky, thicker, and more luxurious. The coat usually has some curl or waves. It is a beautiful, lovely, easy-to-fall-in-love-with look on a Miniature Schnauzer. Furnishings can vary from somewhat thick (Mega Coat) to extremely thick (a Super-Mega coat). What about the "Merle Schnauzer"? The Merle color pattern is problematic because it carries blindness, deafness, and oftentimes an immune system defect. The gene that causes the merle pattern and blue eyes may also negatively impact hearing, eyesight, the organs and the immune system. I ask you to please help keep these bad genes from bleeding any more into the beautiful, fun and loving Miniature Schnauzer breed we cherish so much. Puppy buyers, educate yourself before you fall prey to breeders that are only breeding for the novelty of an unusual color, and not for the health and safety of the breed. Do a simple Google search useing the terms: dangers of the Merle gene. You will be shocked and hopefully moved to reconsider the purchase of a "Merle Schnauzer."